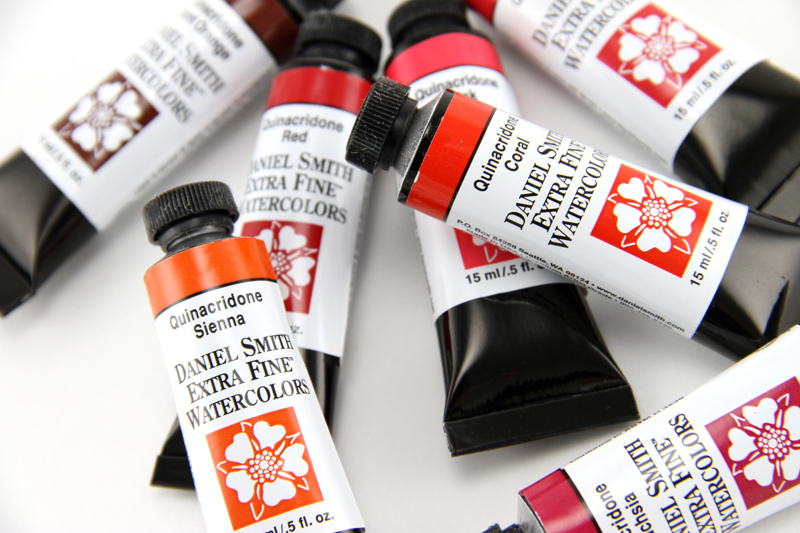 So what are Daniel Smith Watercolour paints? It is a question we are frequently asked when we meet consumers at shows and galleries. In a sentence they are pure, intense colours combining the power of staining pigments with the luminosity of the transparents. Quinacridone watercolours flow beautifully for extremely smooth washes, have incredible depth of colour and can be lifted easily while still wet. They're exceptionally strong yet transparent, ideal for glazing, and many artists use them as vibrant replacements for earth colours. Understandably, they've been very popular colours since their introduction - people just love them! Quinacridone Purple - A rich, powerful and juicy purple with a slight reddish cast. It's non-granulating, so washes are smooth and controlled and it mixes beautifully. A luscious, versatile colour. Quinacridone Violet - Disperses evenly with slight granulation and moves from deep darks to clear, glowing washes. Like all Quinacridones, it is an extremely lightfast organic pigment. In terms of complementary couples, Quinacridone Violet mixes best with a cleaner primary green. Quinacridone Sienna - The ultimate low-staining glazing pigment, certainly finer than any Burnt Sienna. For the traditional and purist watercolour painter, Quinacridone Sienna divides yellows from reds, falling on the orange line. Quinacridone Sienna is easy to mix without revealing a hidden gray. It works especially well in damp under painting, with over painted full-bodied pigments such as Indigo or Payne's Gray. Quinacridone Magenta - This deep red violet disperses evenly with slight granulation and moves from deep darks to clear, glowing washes. In terms of complementary couples Quinacridone Magenta works especially well with yellow greens. Quinacridone Burnt Scarlet - This slightly sedimentary rich dark red-brown could lighten, brighten and eliminate mud browns in all your paintings. Use with Quinacridone Coral for branch and blossom paintings. Quinacridone Pink - Quinacridone Pink is a precise perfect low-staining pink. Try with Indigo for deep dusty purples, or Indanthrone Blue for rich, clear purples. Quinacridone Pink can be mixed with Quinacridone Sienna or Burnt Orange in dilute wash states to create flesh tones or convincing sunsets. Quinacridone Coral - A treat for the eyes of both painter and viewer, this intense Quinacridone colour is a clear red tinged with pink and orange. Quinacridone Burnt Orange - Add to French Ultramarine sky washes to gray the blue mix and render a full value scale. Use Quinacridone Burnt Orange to modify Sap Green in landscapes to achieve rich, mossy greens that coordinate land with sky. Quinacridone Rose - Its red-violet colour, lends itself to fabulous purples. Try with Indigo for deep dusty purples, or Indanthrone Blue for rich, clear purples. Quinacridone Rose can be mixed with Quinacridone Sienna or Burnt Orange in dilute wash states to create flesh tones or convincing sunsets. Quinacridone Gold - Everyone's favourite, Quinacridone Gold replaces Raw Sienna and adds versatility with its glazing and mixing capabilities. It is an excellent low-staining golden yellow pigment that can enhance any mixture. Try glazing an old "failure" with Quinacridone Gold to begin a rescue operation. Quinacridone Red - A true, pure medium-staining red. Drop Naples Yellow into Quinacridone Red and create a peach, or paint dry brush strokes onto apples. Quinacridone Fuchsia - A necessary watercolour for painters who embrace colour - a brilliant, slightly violet, red. Never bashful, Quinacridone Fuchsia remains strong even when mixed with water. Your light washes will be bold, and at full strength, few paints can compare to the uncompromising richness of Quinacridone Fuchsia. Completely transparent and satiny smooth, this radiant watercolour is sure to become a staple on your palette. No other colours have both the intensity and transparency of the Quinacridone family. They are synthetic organic pigments, created in the world's most advanced colour laboratories. Minuscule pigment particles are exceptionally uniform in size and shape, which translates to unfailing behaviour in the paint. The Quinacridone colour range - rich gold’s, oranges, pinks, reds and violets - covers a wide swath of the spectrum. Many artists have substituted the fantastic earthy gold’s and oranges for traditional ochre’s and sienna’s, instantly super-charging their palettes with these intense and extremely lightfast colours. Now turn your palette from ordinary to extraordinary with the incredible depth of Quinacridones!